Wow, the news from Telltale is devastating, a loss for games as a medium. My sympathy to all those affected <3 Naughty Dog is hiring, please reach out to @NaughtyDogJobs! That's very cool. A lot of developers could use good story writers. User Banned (2 Days): Inflammatory Drive-by. History of similar infraction. Never let a PR opportunity pass you by. Everything about that response is amazing. Great to see this kind of stuff happening during a pretty terrible time for these folks. This is a slight comfort atleast, good to see their colleaques reaching out. Warms my heart. Wich studios are close to Telltale location wise? very awesome, glad to see so many studios step up for the people who just lost their job. Or they actually need developers, and having experienced developers available for hiring is something they want? Some of their writers would fit right in at Sony with their oft superb focus on narrative/story based games, which is why I am pleased to see the likes of Bend Studio, Sucker Punch and Naughty Dog helps those affected by this abrupt closure find themselves a new job. I think Ubisoft SF would be closest? But not entirely sure of others. Why ya gotta come into a thread about some uplifting news for these folks and do this? All classy. Very nice to see, and hopefully everyone can recover their careers from this. It's never a good thing to see a business go out in this industry. There are some truly amazing people out there. Too bad I don't see Bethesda on the list, they would benefit from good writers. I guess nearly everyone is hiring in the games industry. the game industry is great like that. Every time a studio shuts down, companies reach out. How many employees were @ Telltale? I guess if there's one positive thing to come out of Telltale's closure, it's that some other developers are going to get a nice injection of talent. Warms my heart to see so much outreach. I have nightmares about suddenly losing my job like that. Hopefully everyone is okay. Quite a few. Several hundred IIRC. Now they're down to 25. Don't kid yourself. These mass firings are a boon for many studios. They get to hire experienced/talented devs at a discount, just by sheer desperation, especially in such an abysmal bankruptcy as TTs. Unionization can't come soon enough. Getting a job is all that matters for these developers, they have families, being unemployed and having a family you need to provide to and not being able to do it is the most gut wrenching feeling ever, i hope all those affected land on their feet ASAP. Omg! Blizzard! Hire their writers! Do it! banned... people are naive. ERA is a Gaming Industry website, you can't say too much sh*t about Gaming Industry or its actors. But I agree with this post. This. Good news of course but Companies are Companies and they really don't care about your life and any other people. Interesting.... Ubi going into narratives games? It seems like a lot of the TT team will be week taken care of. Cool. I hope many can get a new Job. 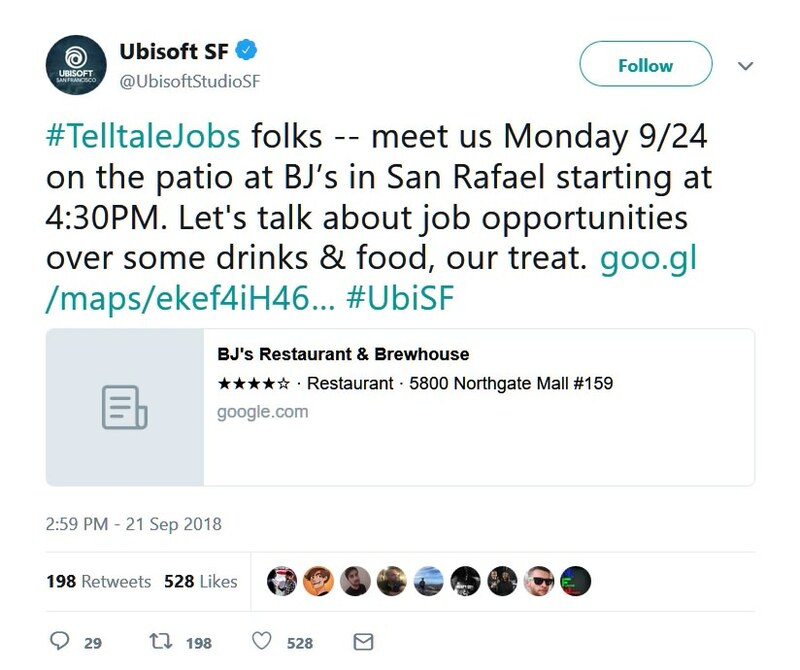 I think it’s more just generally looking out for those who lost their jobs suddenly with potential opportunities, not an indication of a type of game Ubi wants to make. Ubisoft is a massive company that do tons of projects and hires tons of people. Don't read into this too much.